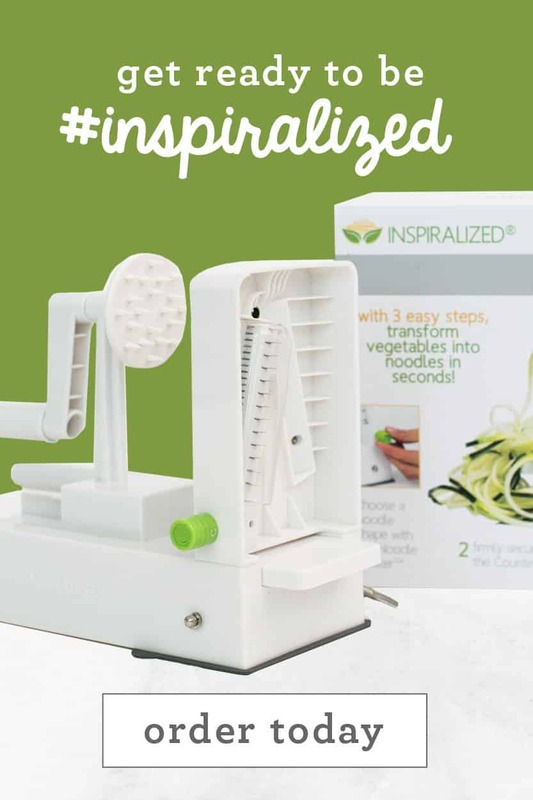 Of course, my favorite veggie to spiralize is the zucchini. It’s kind of like my “first born,” if I knew what having a first born was like. The zucchini was my guinea pig, especially because I started the bulk of my spiralizing during the summer, when zucchinis grow rampantly. However, I love experimenting with all vegetables… and fruits! 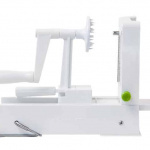 Pears and apples are probably the easiest fruits to spiralize. 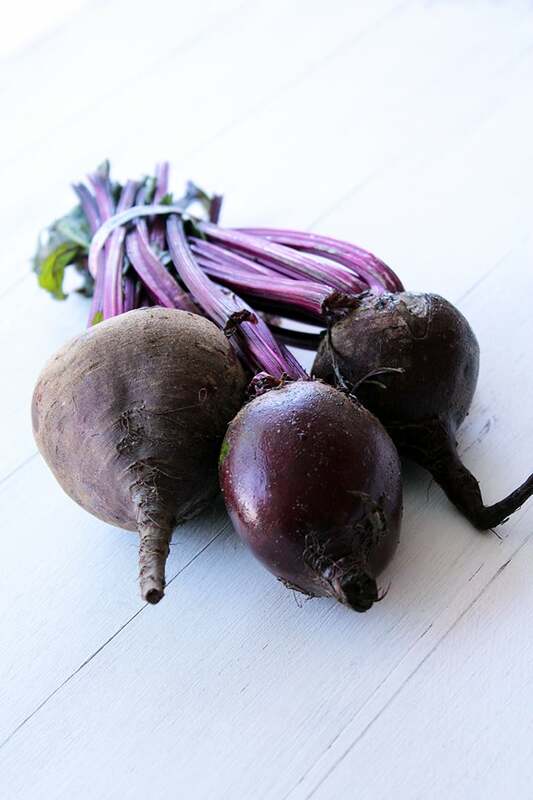 As for veggies, the messiest are beets: your hands and countertop get stained (temporarily) red. It makes for a fun belated Halloween scene, but not a fun cleanup experience. 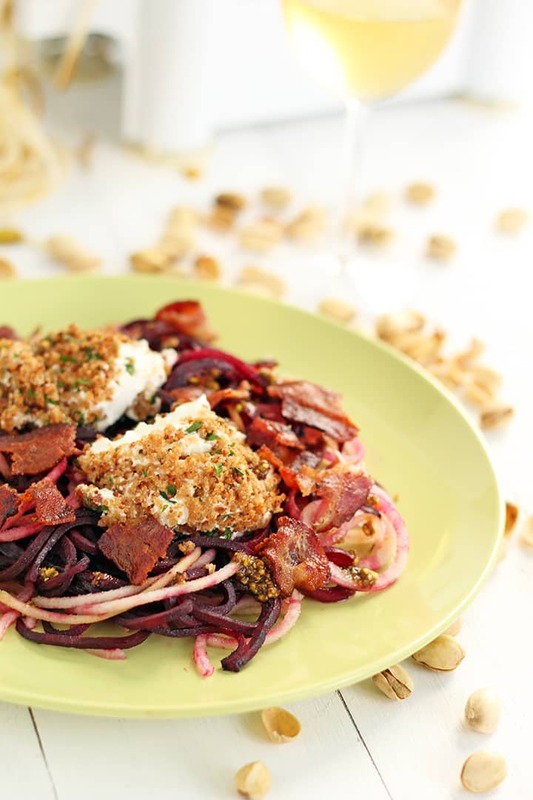 Beets are lovely to eat in noodle form, as they take on a completely different taste and obviously texture. As for pear noodles, well, stop thinking of them as a fruit you slice and eat as a snack. 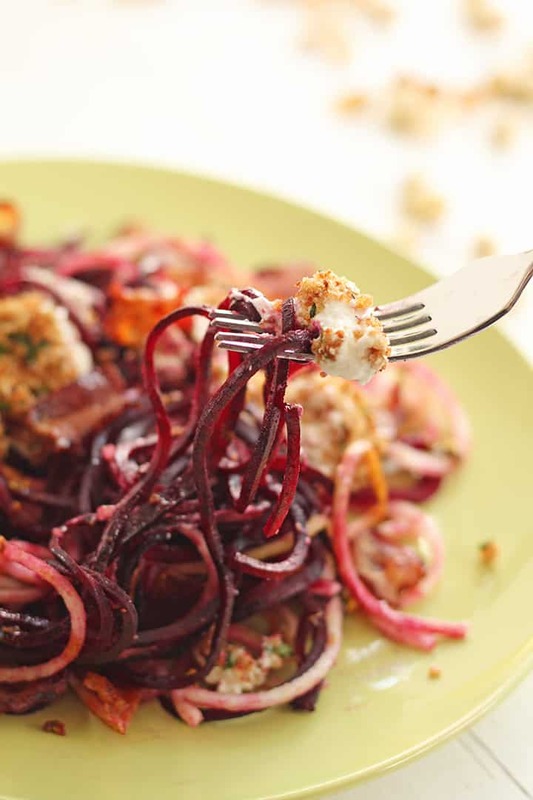 When you spiralize them, they become a sweet addition to a savory meal. 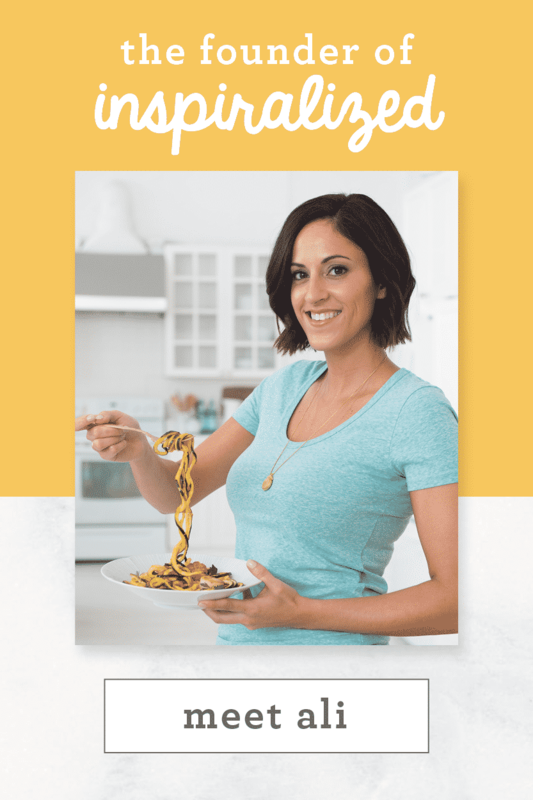 In honor of all of the possibilities that the spiralizer brings into our lives, let’s learn how to spiralize a beet and a pear. 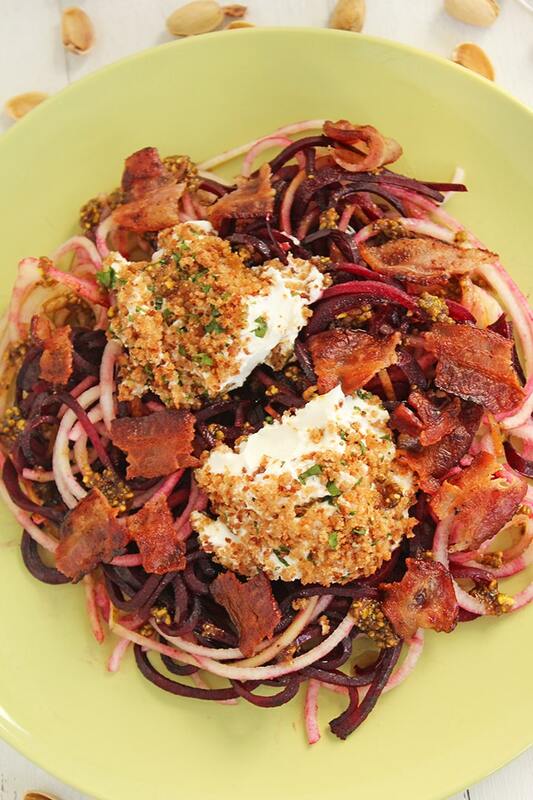 Then, we’ll finish up with a stunning plate of beet noodles with a lip-smackingly tasty bacon-pistachio dressing. 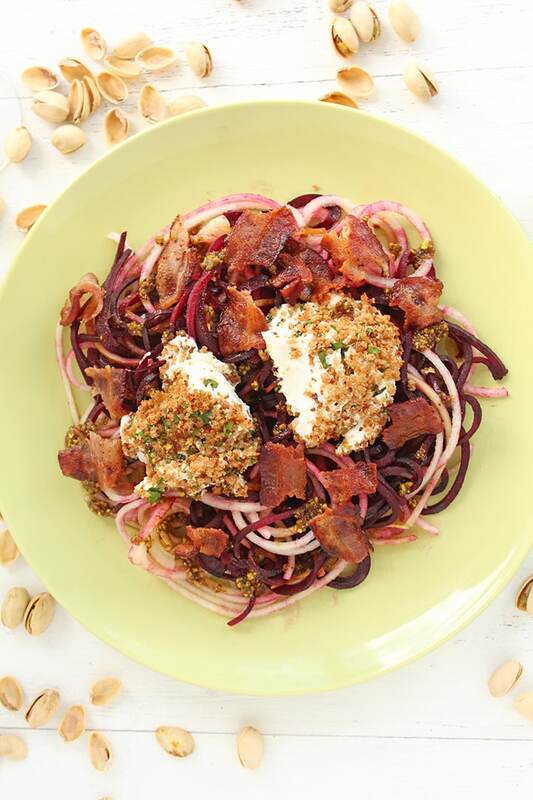 Yes, bacon and pistachios. Warmed. As a dressing. Did I mention that it comes topped with a freshly baked roll of goat cheese? You’re welcome. Chop the pointy end (the top) of the pear off so that it is flat. 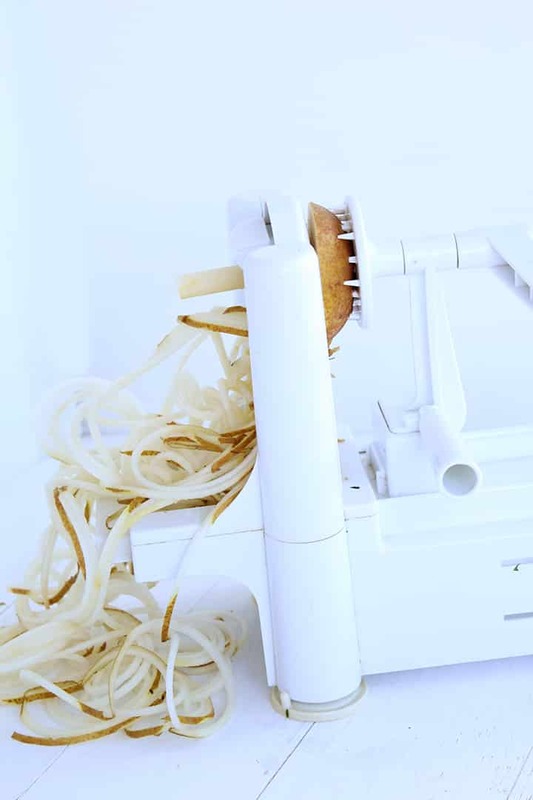 Don’t chop off the other end, just load it straight into the spiralizer. 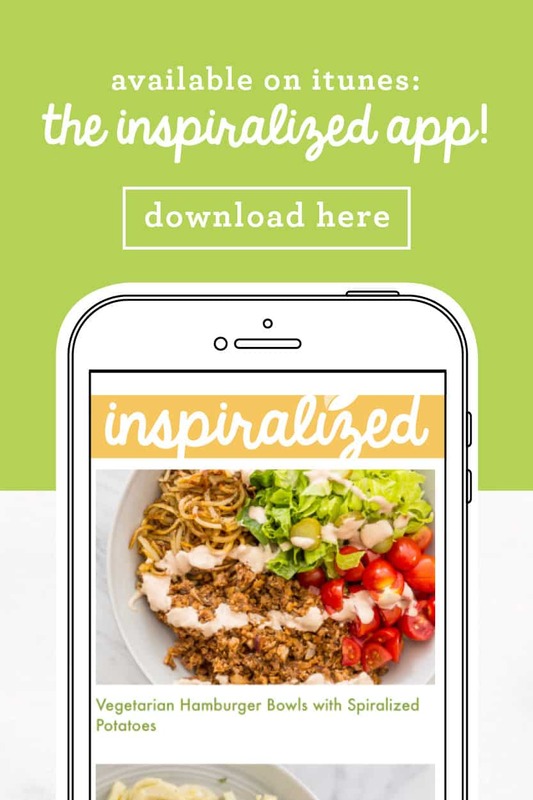 Spiralize! 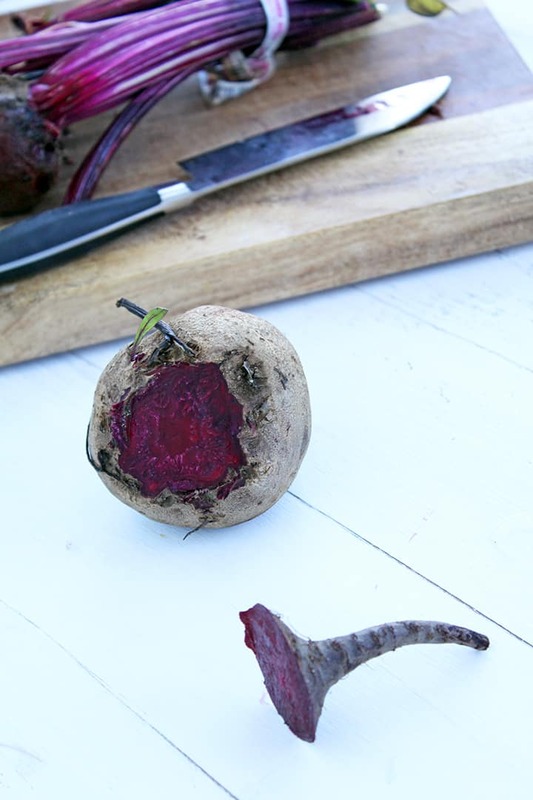 Chop the beet off the stalks and slice both ends off so that both ends are cut and flat. 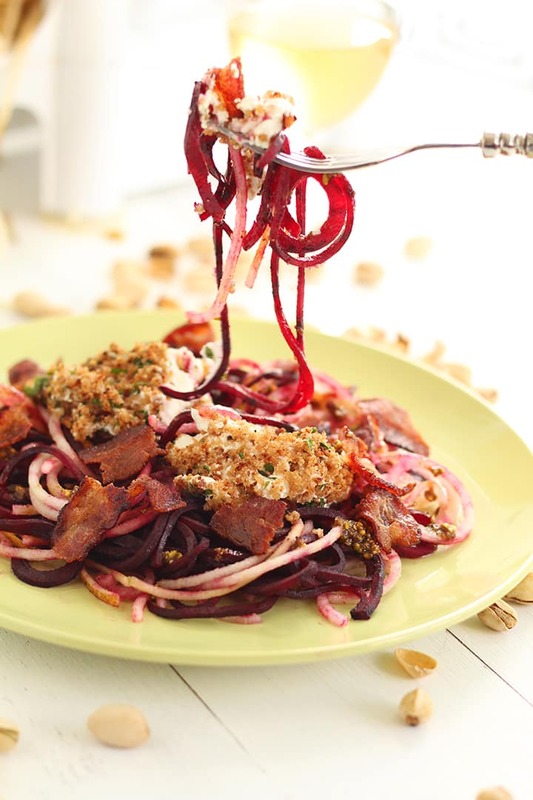 Peel the beet and then load it onto the spiralizer. 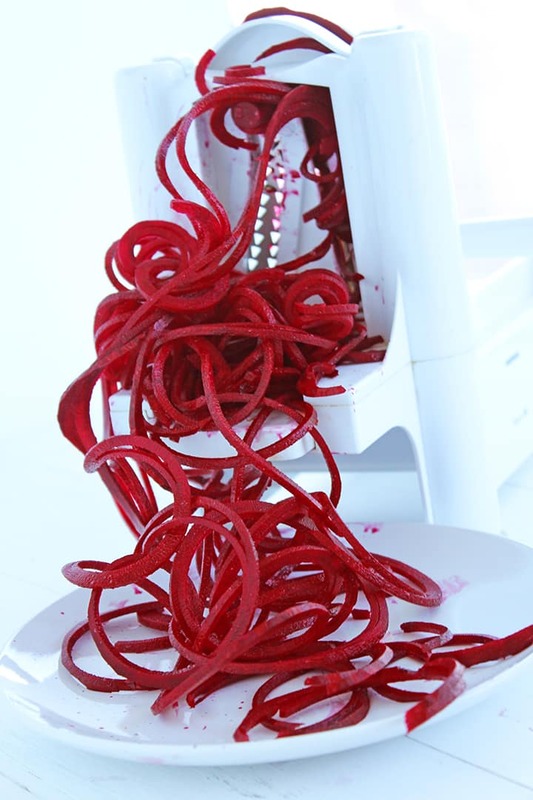 Spiralize! Place the english muffin in a food processor and pulse until made into breadcrumbs. Place a medium skillet over medium heat and add in a 1/4 tsp of olive oil. Cook breadcrumbs, tossing occasionally, until toasted. 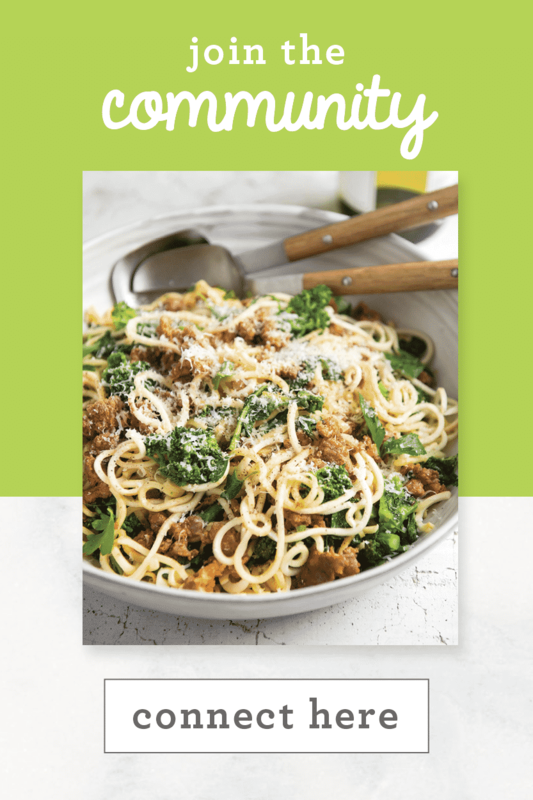 Transfer breadcrumbs to a bowl, add in parsley, season with salt and pepper and set aside on a plate. 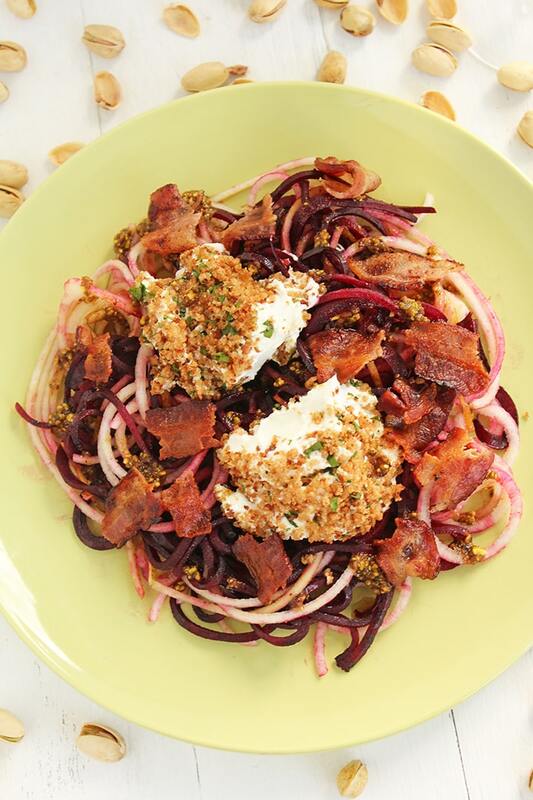 Take your goat cheese and roll it in the breadcrumb plate and roll it around until it’s coated. 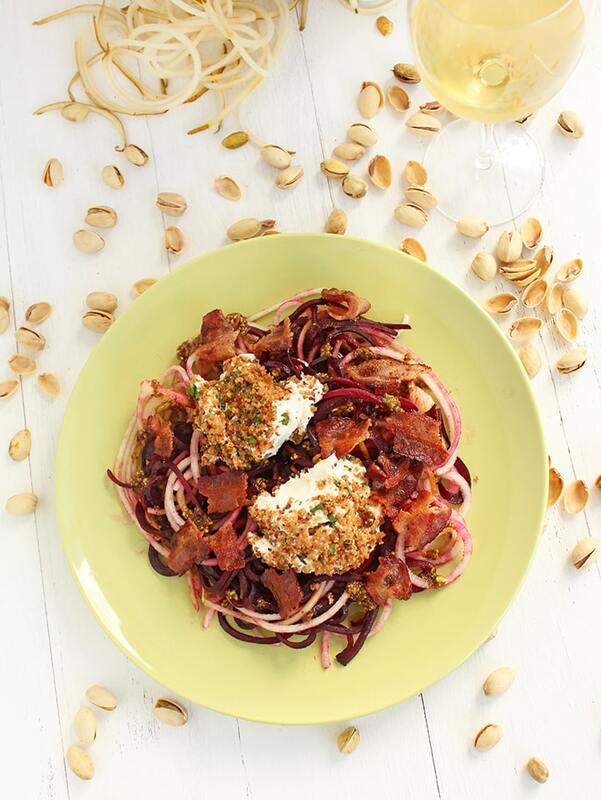 Place the goat cheese on a baking tray coated with cooking spray. 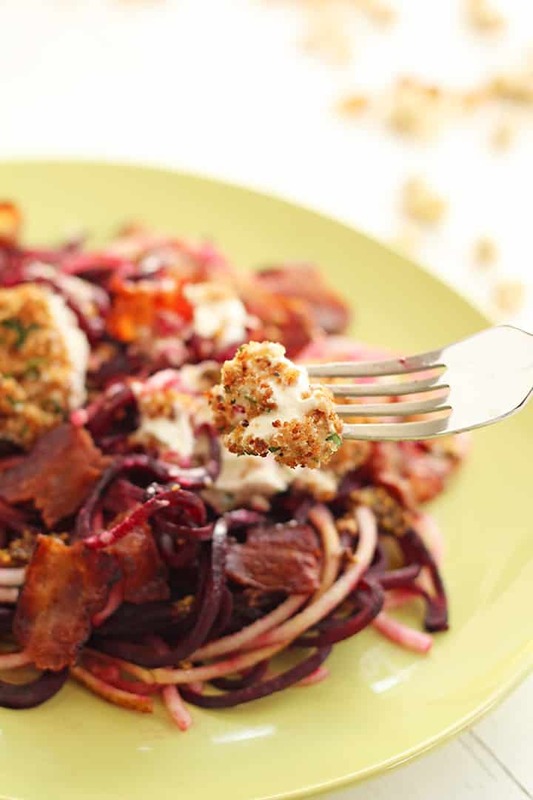 Place the beet noodles on another baking tray coated with cooking spray. 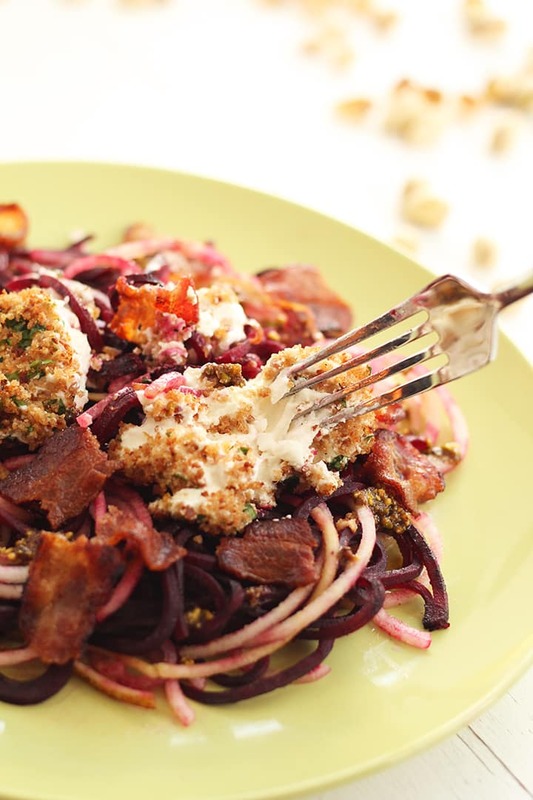 Place the goat cheese and beet noodles in the oven. Cook both for 7 minutes. While the goat cheese is cooking, place a large skillet over medium heat. Add in your slices of bacon. Cook until to your preferred level of crispiness and set aside on a paper-towel lined plate. Save 1 tbsp of the bacon grease and set aside in a bowl. Prepare the pistachio dressing. Add all of the ingredients listed into a food processor and pulse until pistachios are pureed and no major chunks of nuts remain. Add to a bowl or dressing shaker and add in the bacon grease. Stir. 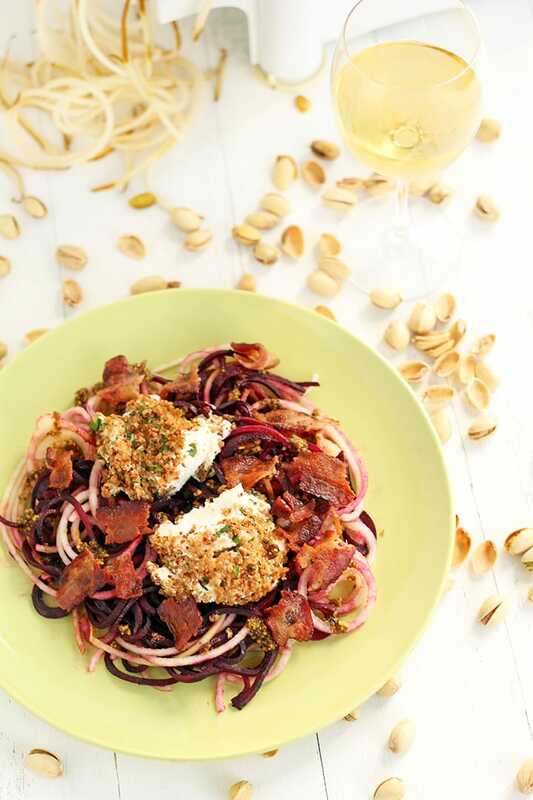 Place your beet and pear noodles into a bowl and drizzle with pistachio dressing. Toss to combine and then plate. Ali, outstanding photography! 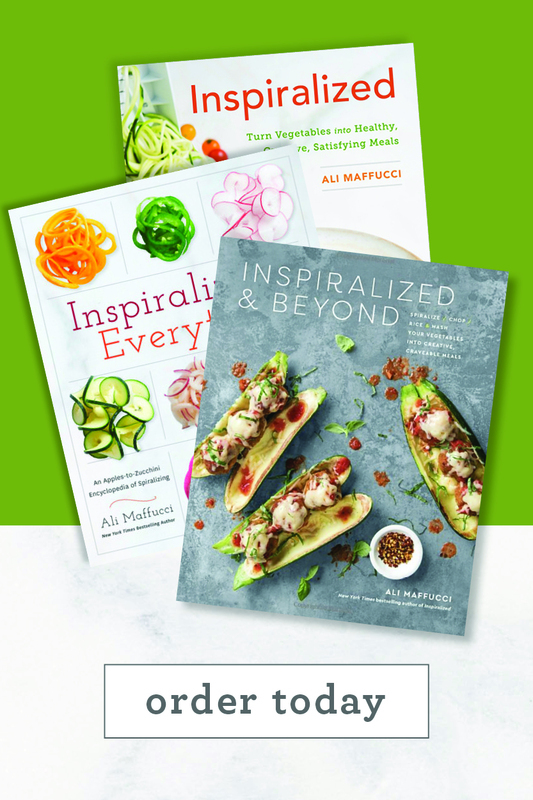 Our CSA season starts this month http://www.kyvfarm.com and we are inspiralized! Thank you. Kevin - thank you so much for reaching out! I'm happy to hear you're Inspiralized, and good luck in your season! 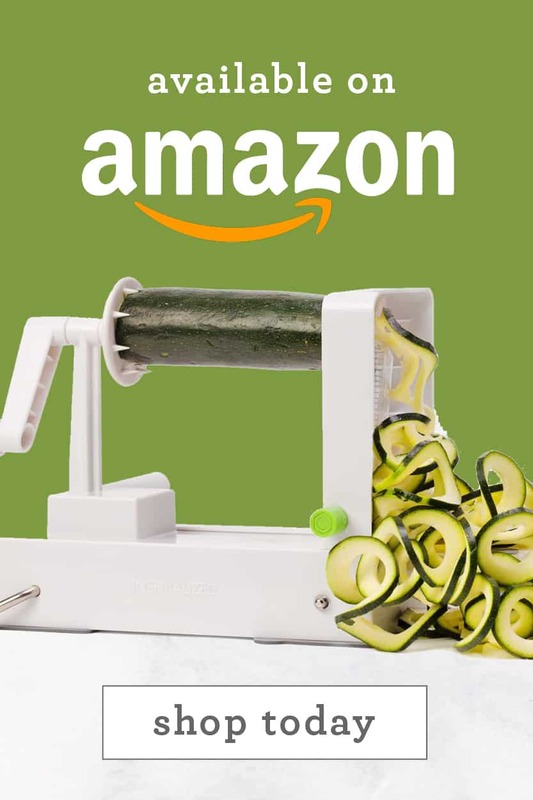 Ali, my friend's laugh at me because I take my spiralizer camping( not in a tent, thank goodness). I made this dish tonight and it was fantastic. 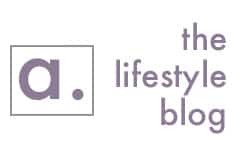 Love your site and your creative recipes. Thank you for sharing. Just made this recipe for dinner. AMAZING. I will be making this again for sure! 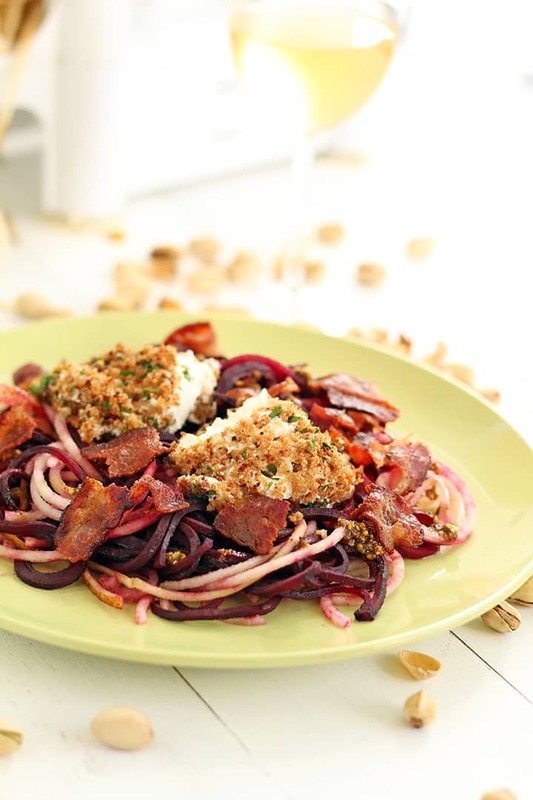 I've never had beets before, but I think this would be an awesome way to try them, since I love goat cheese and pears. One question: Is there any way to make this nut free, for nut allergies? This recipe tasted great. But, I had a bit of difficulty with the dressing. I found the dressing to be very thick. Not sure where I messed up, but it was way to thick to drizzle.